To log on, or not to log on. That is the question. “Dig out from under when you return” was the philosophy of 46% of those surveyed, while 42% said they kept up with e-mail every day. Another 10% said they either didn’t use e-mail, or take a vacation or both. Younger workers were the most likely to stay tethered to their inbox while on vacation – 51% of those under 35 kept up with e-mail every day, compared to 40% or less among their older aged colleagues. Digging out from under after vacation was most popular with those 35 to 54 – half followed that strategy. 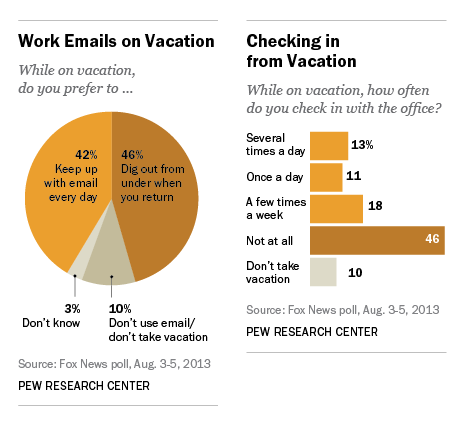 When it came to checking in with the office while on vacation, 46% said they didn’t do it at all while 42% checked in at least once a day or a few times a week. When Fox News asked the question in 2005, 59% of those surveyed said they didn’t check in with the office at all while on vacation. Which camp are you in? Tell us in the comments section.